These have no business being as tasty as they are. This is Green and Blacks tier. This is a game changer. I got two boxes of Strawberry Cheesecake. The flavor and texture is okay, it's no carb killa but it's not as bad as some others make it. However, the farts you produce on this stuff... holy moly I shouldn't have bought two whole boxes. I am now dead inside. These are unreal! By far the best version of bars of this nature around, caramel nut is next level stuff! I have had a couple of boxes of these now, and I have to say they are very tasty. 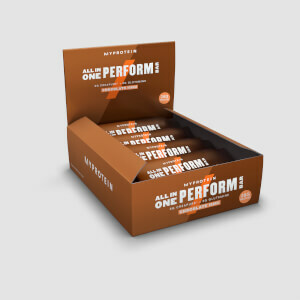 It's hard to believe that you are eating a 200 calorie, 21gram proetein bar. First class taste, with a nice crunchy and chewy texture. The only issue is trying not to eat the whole box ion the first week. I have one either before or after training, in between meals.. Dark Chocolate & Sea Salt flavour is Absolutely Amazing! soooo tasty!! This is one of the nicest chocolate bars ever! The macro's suit my needs too. Highly recommended! I ordered a box of the dark chocolate and sea salt bars as the caramel nut were out of stock. These are delicious and very tasty - just like i'm eating a dark chocolate bar. Caramel nut is insane. By far the best protein bar I have tried! The macros are awesome, making it a perfect snack when cutting! 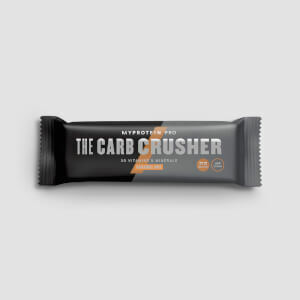 I've had my fair share of protein bars in the past, but this Carb Crusher is by far the best one in terms of taste and nutritional value, even when in a cutting stage. I bought two boxes and I do not regret it at all! 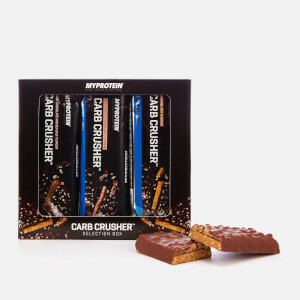 Definite favourites are the caramel nut, and the dark chocolate. Absolutely ideal for when you don't have time to cook a meal or you want a change from a protein shake. Saves me at the weekends!